I let the Little Engineer pick what we’d do for our contribution to Mama Miss’ 20 Days of a Kid Made Christmas: Ornaments series. 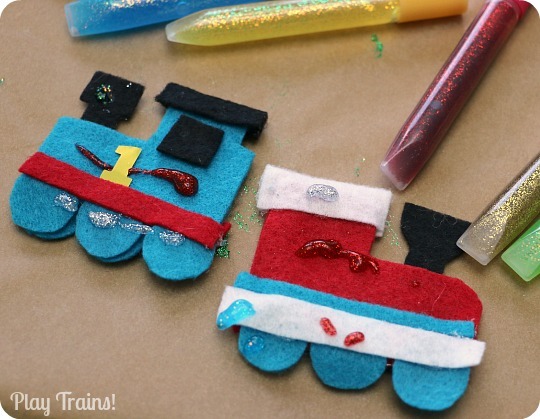 Of all the ideas I suggested to him, he was most excited by the idea of making a felt train ornament, so that’s what we’re doing today! 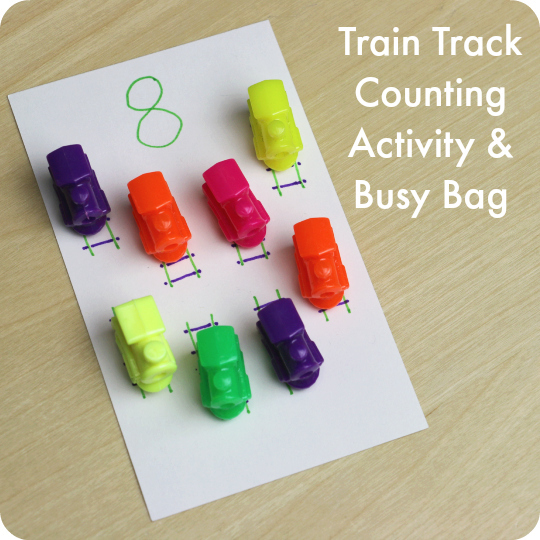 This is an easy craft that kids can help make to varying degrees, depending on their age and skill level. 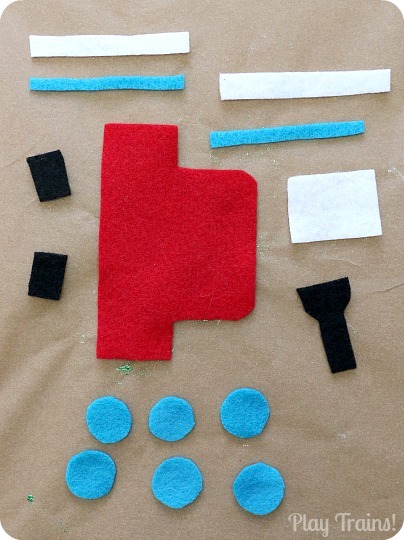 Step 1: Cut out the felt pieces. 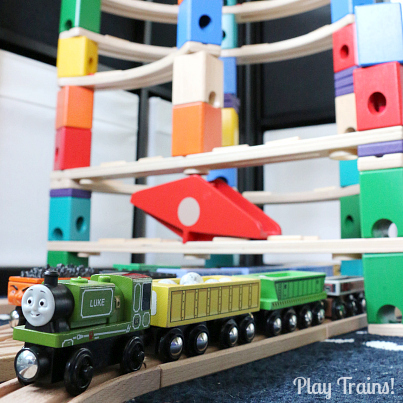 I cut some felt train pieces from the colors we wanted to use. They’re similar in shape to the pieces of the Valentine Felt Train play set I made earlier in the year, with one difference: I folded the felt in half to cut the shape for the main boiler/cab part of the engine. The two layers of felt with hot glue sandwiched between them are much stronger than a single thickness of felt. You can see what the engine piece looks like unfolded below. 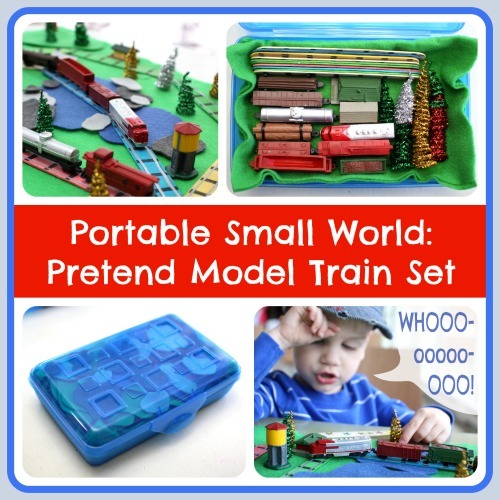 I also cut out pieces for a Thomas the Tank Engine-inspired engine as well. Cutting out the felt is still far beyond my son’s scissor skills, but older children could possibly do this by themselves. 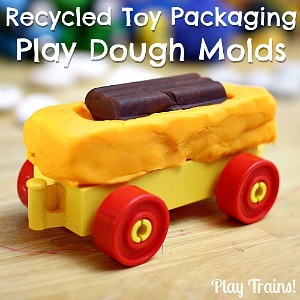 Step 2: Hot glue the train together. My usual rule about not mixing hot glue and my camera applies once again, so no photos for this step, but it’s easy enough. Glue the funnel in place to one side of the inside of the main engine piece. Spread hot glue on half of the main engine piece, then fold the other half over and press them together. Glue the wheels on both sides, and glue the footplates over the tops of the wheels. Glue on the windows, and then the cab roof, folding it over the top of the cab to glue it to the other side. 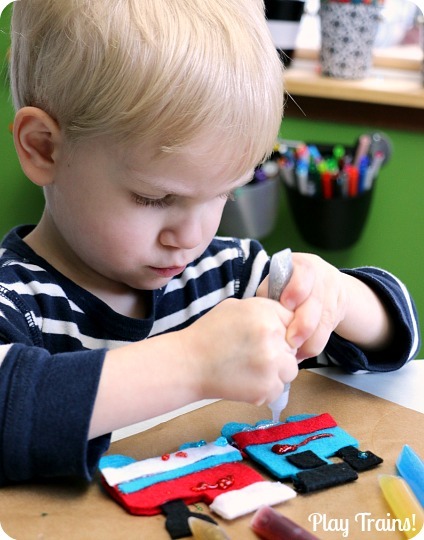 If your child is comfortable using a hot glue gun, they can help with this step. I asked the Little Engineer if he wanted to glue his engines together. But after a couple of tries with a low temp hot glue gun earlier this year, he’s decided it’s still a little too hot for him to want to work with. So I did the gluing this time. 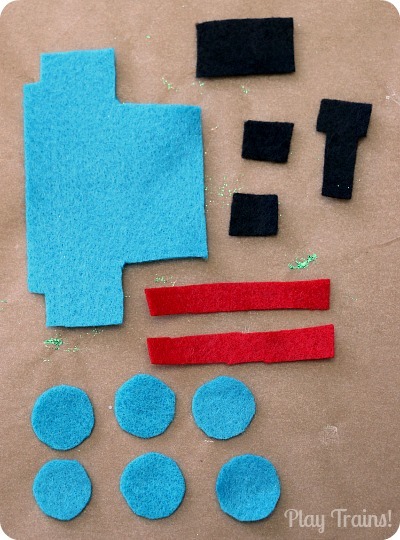 Step 3: “Detail” your felt engines. 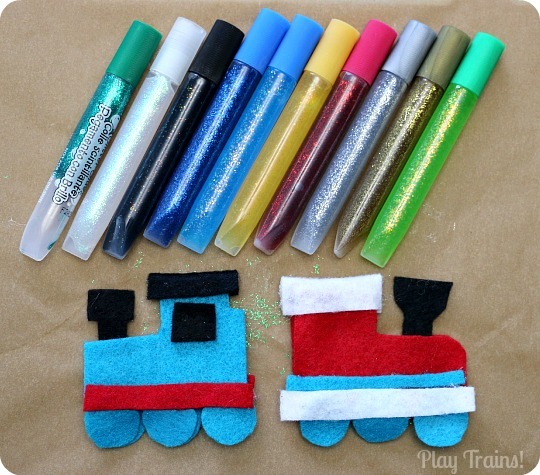 The last time we made a similar felt engine (as a finger puppet — the Little Engineer’s idea), he went crazy with the glitter glue, squeezing it all over the engine and using it to stick other objects to the train. 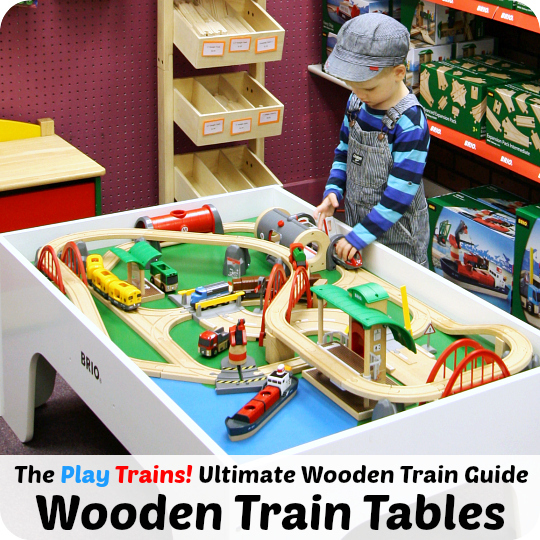 This time, he very carefully added only a few elements to each engine. 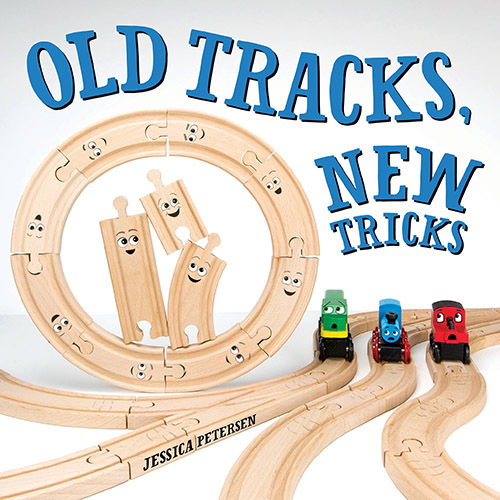 He took special care trying to make a straight connecting rod across Thomas’ wheels. I also found some Thomas confetti from last year’s birthday party that had shiny, gold number ones for him to use. Step 4: Let the glitter glue dry. Depending on how much glue was squeezed on, it may take a day or two for the glue to dry completely. Step 5: Hot glue a loop made from a thin strip of felt to the back of the cab roof. 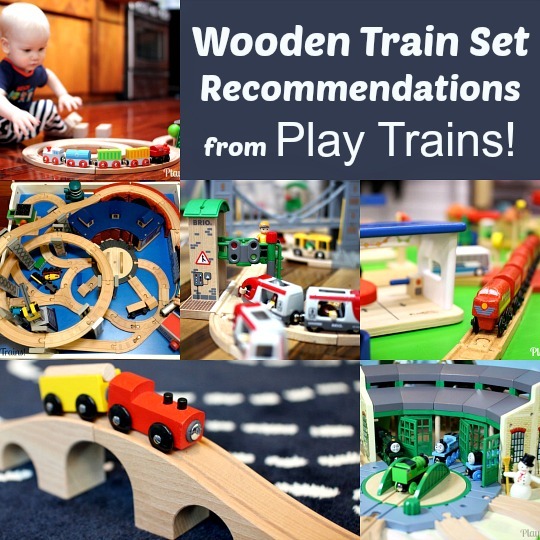 Once again, I got to do this job myself, but the Little Engineer was very vocal about which color of loop was allowed to go with which engine. 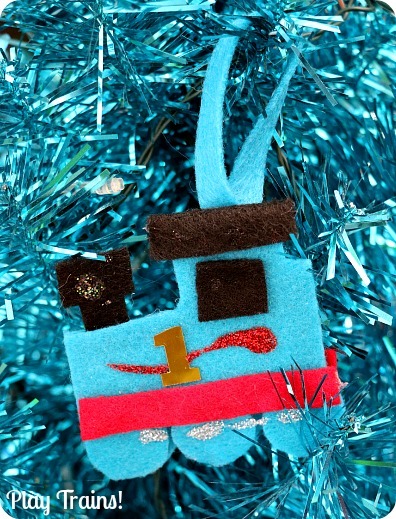 They both look very cute hanging on the Little Engineer’s shiny blue train-themed Christmas tree! 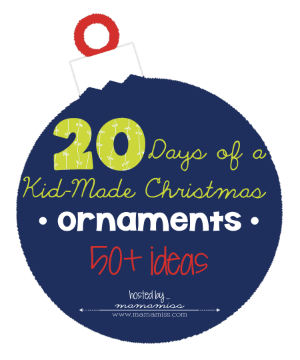 This post is part of Mama Miss’ 20 Days of a Kid-Made Christmas: Ornaments series. 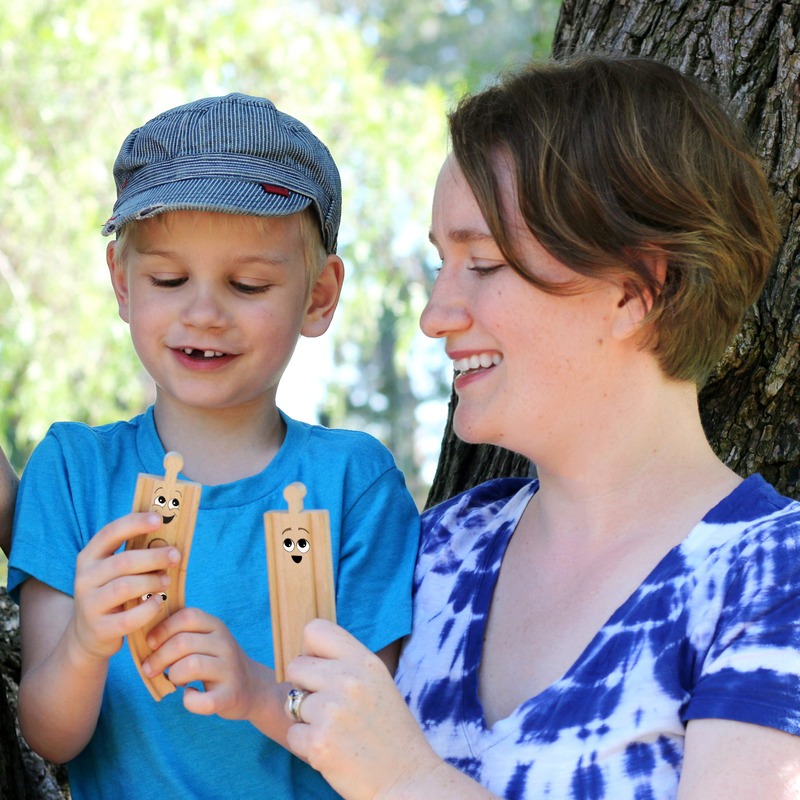 We’re sharing today with two blogs that I admire, Mama Smiles and One Perfect Day. Make sure you go see their ornaments — I’m sure they’ll be fabulous! Also, for those of us who love browsing visually, we have a Pinterest board for the series. 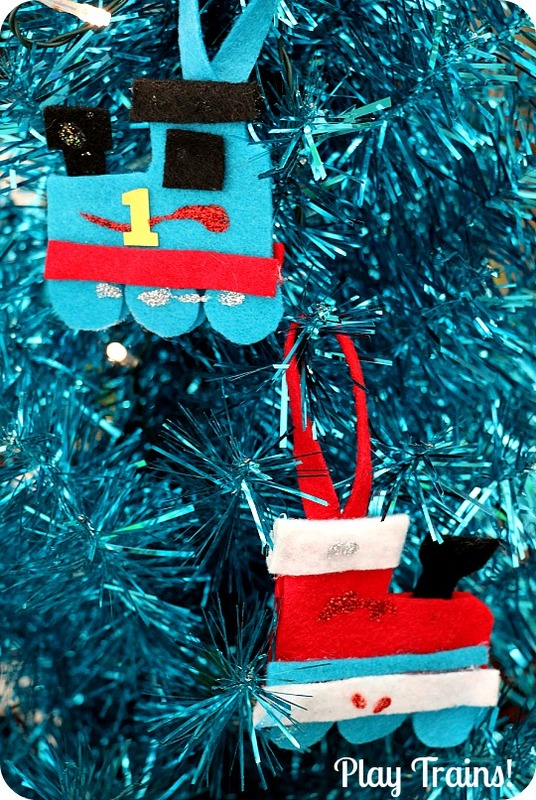 Follow the Kid-Made Christmas: Ornaments board for lots of inspiration for crafting with kids this season. 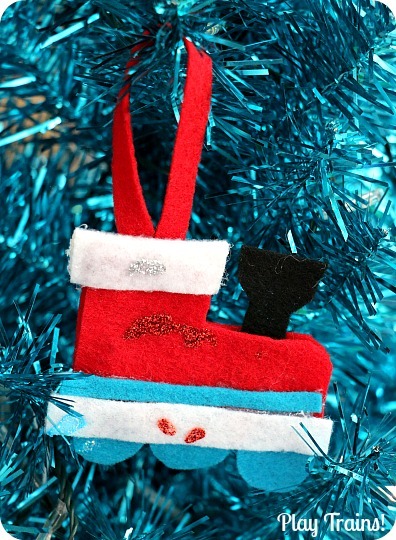 Just link up a KID-MADE ornament you’ve created with your kiddos (limited to 2 a day). 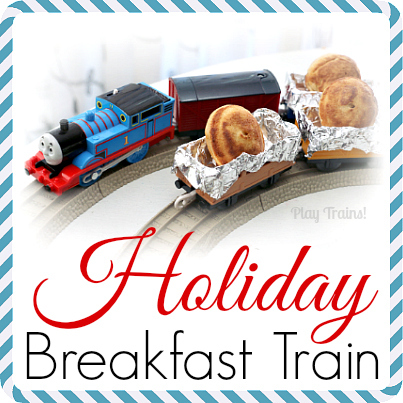 Make sure to pop by these other fabulous bloggers too, that are participating in this series. See the schedule here. Aren’t these lovely. 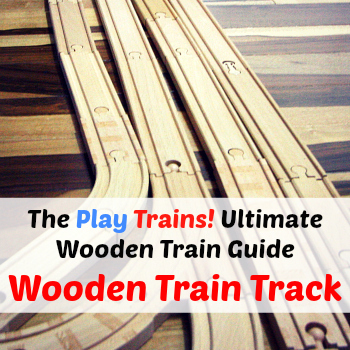 A definite must do for any train fans. Love it! Thomas & James?